For many of us, reaching 100,000 miles on the odometer is an impressive feat. At Metro transit, we take it up a notch — all the way up to one million miles. Through its industry-leading vehicle maintenance program, a MetroBus reached one million miles on the odometer on the original engine and without a mid-life overhaul on March 29, 2017. Metro operates a fleet of 400 public transit buses for the St. Louis region, and the million-mile bus is the first of what could be at least a dozen that potentially will reach that unique milestone in the next couple of years. To celebrate this special milestone, representatives from the St. Clair County Transit District, Federal Transit Administration, the City of St. Louis, Cummins and Gillig joined Metro and Bi-State Development (BSD) leadership and employees in Belleville, Illinois on March 30. 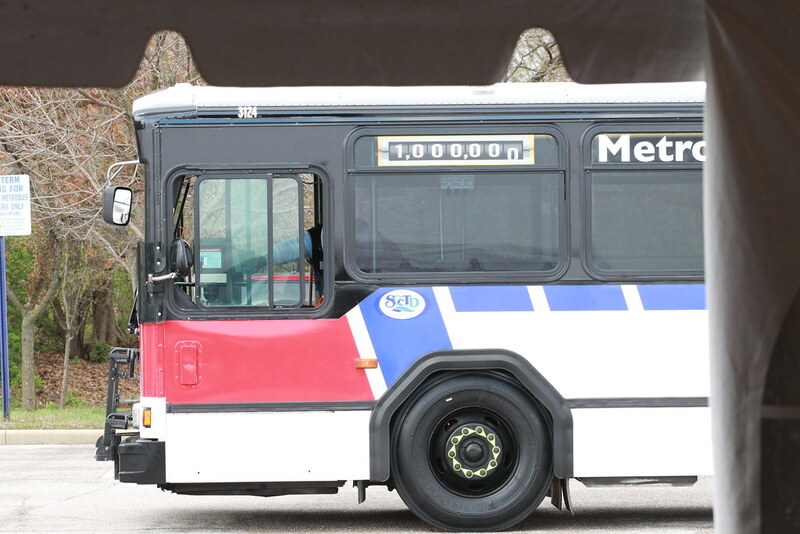 The million-mile bus, which Metro purchased and put into service in 2001, is a Gillig Phantom with a Cummins M11 engine. Metro operated the bus in regular service in the City of St. Louis and in St. Louis County, Missouri, for the first eight years, before it was purchased by one of its key transit partners, the St. Clair County Transit District (SCCTD). Since then, Metro has operated the bus for the SCCTD in St. Clair County in Illinois, across the Mississippi River from St. Louis. The bus is still in active service in Illinois, recording more than 8,000 miles a month and 96,000 miles over the past year. Over the last 16 years, the bus has traveled more than a million miles without an engine overhaul or significant mechanical issue. This unique milestone is the result of an innovative, internationally-recognized maintenance program. In 2001, Metro began an internal transformation to completely redesign the fleet maintenance program, changing the focus from reactive to proactive preventative or predictive maintenance, replacing parts before they actually fail. Today, Metro leads the transit industry in several performance, reliability and maintenance metrics. “In 2000, the lifespan of our buses was around 12 years or 500,000 miles. Today, we average 15 years and more than 750,000 miles, well beyond industry standards,” said Ray Friem, Executive Director of Metro Transit. Reaching a million miles is also a notable achievement due to the demands of the public transit industry. Metro buses operate long hours over tens of thousands of miles each year, for many years, in all types of driving and traffic conditions, as well as in extreme weather and temperature conditions. In addition to industry-leading performance, the maintenance program also has been able to substantially reduce capital expenses. By extending the operational lifespan of its buses, Metro is able to purchase a single bus, which today have a price tag of more than $400,000, to meet the demands that other transit systems would need two or three buses to satisfy. These efficiencies ensure that taxpayer funds supporting public transit are wisely invested and used to their fullest potential. Metro’s innovative approach to maintenance has also substantially reduced operational costs. In a study published by the Pioneer Institute, a non-profit research institute, the vehicle maintenance costs per hour of bus operations were analyzed for the 25 largest public transit agencies in the United States. The highest vehicle maintenance cost came in at $44.30 per hour of bus operations. Metro in St. Louis recorded a vehicle maintenance cost of $18.80 per hour of bus operations. Metro’s preventative maintenance program is internationally recognized for producing the highest level of vehicle reliability and efficiency. It has been featured in industry magazines and publications, and has drawn the attention of public transit systems from around the world, who write, call or come to St. Louis to see how they can model their programs after Metro’s successful approach. In 2016, the Federal Transit Administration specifically highlighted Metro as a case study of what can be achieved through transit asset management. The million-mile bus will continue operating regular transit service in Illinois for the next eight months. Next year, the bus will be moved to Redbird Express service, which provides special, direct shuttle service for baseball fans between St. Clair Square in Illinois and Busch Stadium in downtown St. Louis. How many of those 2001 series buses are still in sevice? I think there were 99 originally, although I never did see # 3118. The last time I saw #3124 in Missouri, it was wrapped with Missouri Botanical Garden ad in 2008. Joe, there are 16 2001 series in regular service, 23 assigned to the Redbird Express two in training and four in the contingency fleet. #3118 is an Illinois Redbird Express bus that was taken out of active service in 2015 by 6952. In 2001, there were 99 #3100 series 40’ Phantoms bought and 12 #3200 (3201-3212) series Phantoms bought. Never saw those lower 3200 series – just figured they all ran on the Illinois side and I rarely got over there. Did catch 3225-3238 and 3250-3279 and figured 3239-3249 were assigned to Illinois.